A few Sundays ago, it was a joy to gather with 30 friends in London and to Celebrate and Connect with Nature together on International Mother’s Day! It was so beautiful to watch a seed that was planted at the beginning of this year, blossom into an inspiring afternoon of planting flowers, listening to each other’s reflections and being so fully present to our natural surroundings. We opened with a few minutes of silence to soak in our surroundings. Trishna shared the beautiful reading, ‘Planting Twin Trees’ by Robin Wall Kimmerer, which was perfectly fitting to set the tone for the rest of the afternoon. She invited us to reflect on our intentions and reminded us of our place in the vastness of nature. We all shared reflections about what inspired each of us to come along that day and connect with nature in this way and many beautiful stories were shared. Eugene, the volunteer park warden, told us all about the history of this park, how he came to get involved 20 years ago and what inspires him to keep going — watching people heal themselves by spending time there. 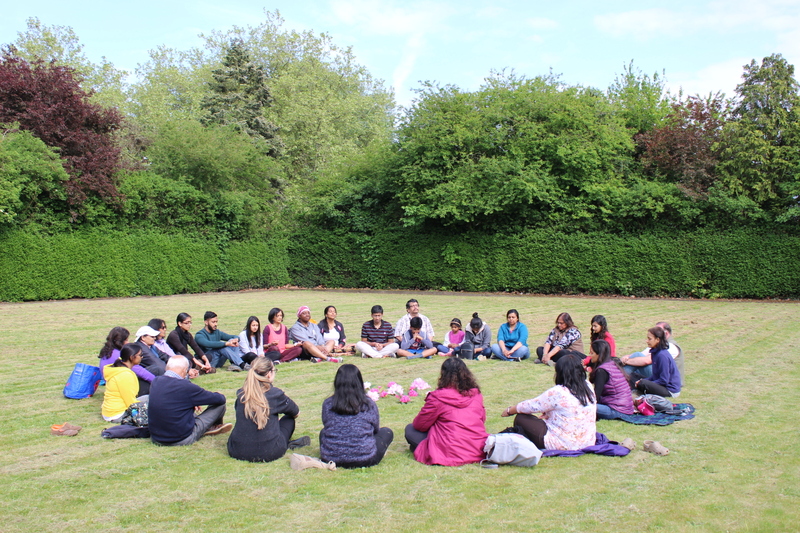 As the circle concluded, we enjoyed a silent walk around the pavilion garden where we had gathered, experiencing the earth on our feet and the sounds of birdsong. Following this, we gathered in the park itself to begin planting flowers. Eugene demonstrated how to plant bulbs, which future generations will come to enjoy and love. It was beautiful to see everyone get stuck in from 4 year-olds to 70-something year-olds 🙂 During our closing circle, it was wonderful to hear the reflections that came up for people after serving in this way. One lady sharing how she will appreciate each flower she sees in a park with new eyes now that she understand the love and effort put into planting it there in the first place, while many others shared that it was their first time every planting something in the earth and how they felt moved to come back and join Eugene as volunteer gardeners at their local park! Let us continue to deepen our connection with ourselves, each other and mother earth. After all, we are nature!